Beijing and Rome seal a trade deal worth 20 billion euros. The airline China Eastern could join the Alitalia. China and Italy have signed the “New Silk Road” on Saturday morning in Rome a letter of intent for the mega-infrastructure project. The agreement was sealed by China’s President Xi Jinping and the Italian Premier Giuseppe Conte on the third day of the state visit of Chinese leaders. Italy is the first country in the G7 countries to join the project. Following the historic routes between the Mediterranean and East Asia, the so-called “One Belt, One Road” initiative will build trade and transport networks between the continents. It provides for the construction of railways, roads and sea connections from China to Europe and Africa. The prestige project Xis is not only intended to bind European and American sales markets more closely to China but also to expand the political influence of the People’s Republic abroad. The “New Silk Road” has already joined dozens of countries, including EU countries such as Greece or Hungary – Austria, Germany, and France. For in the West there are reservations about the project: Critics warn about lack of transparency in tenders, lack of environmental protection measures, one-sided benefits for China, instead of “Win Win” and “debt case diplomacy”. 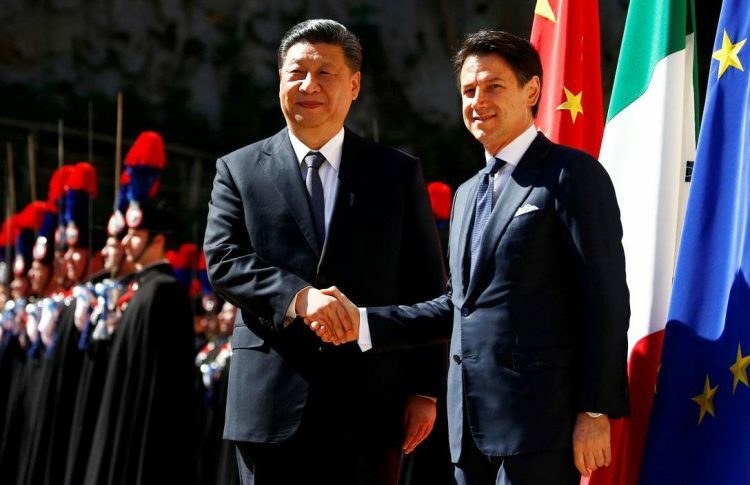 Italy hopes to expand its economic relations with China via the “Silk Road”. The two countries also signed 29 trade agreements worth 20 billion euros in technology, energy, and tourism, according to the media. The airline China Eastern signaled interest in the entry into the ailing Alitalia. An agreement also covers Chinese financing for the development of the ports of Trieste and Genoa. With the trade agreements with China, slipped into recession Italy hopes strong economic growth in the coming years. “Today we say ‘Italy first’ in trade relations,” said Deputy Prime Minister Luigi Di Maio of the populist Five Star Movement on Friday on the sidelines of an Italian- Chinese economic forum. At the same time, Italy remains an ally of the USA, in NATO and the EU. On the other hand, Minister of the Interior and Lega chief Matteo Salvini were more critical. “Nobody will be able to tell me that China is a free-market economy, but I am pleased with the Chinese President’s visit and possible market opening on equal terms,” Salvini said on Saturday. Italy would be “nobody’s colony,” the Interior Minister had emphasized in the past. The European Union is currently fighting for a common line with Beijing; In a ten-point plan, Brussels had recently called for a more assertive policy towards China, calling the People’s Republic a “rival” – but also stressing the economic importance of the EU’s largest trading partner. There is also skepticism about the rapprochement between Rome and Beijing in the USA. The strongest security measures were taken in Rome for the Chinese President and his delegation of 200 people, including several top-level entrepreneurs. Xi will travel to Palermo on Saturday afternoon. Xi’s wife, a famous singer in China, wants to visit the opera house, Teatro Massimo, there. At the state dinner for the Chinese president in the Quirinal Palace, the Italian star tenor Andrea Bocelli sang on Friday evening. On Saturday evening, Xi will continue via Monaco to France. On Tuesday, the communist leader in Paris meets French President Emmanuel Macron, German Chancellor Angela Merkel and EU Commission President Jean-Claude Juncker.